The place and location was great. The unit was within two blocks of a subway station, therefore getting around was easy. The area was safe. The place exceed our expectations. Yes! Near Notre-Dame and some good restaurants and souvenirs shops. Everything about this apt was great, location, space, balcony...everything! Nice bed with fluffy bedding and very well- equipped kitchen! Very quiet and safe location and walking distance from many bars. The Location is perfect. You could see Notre Dame from the window. And Georges Pompidou is just 3 mins away. Apartments Paris Center - At Home Hotel offers contemporary, furnished apartments with a fully equipped kitchen and free Wi-Fi, in Paris. They are located in different locations and within walking distance of various tourist attractions such as Noter Dame, the Louver Museum, the banks of the Seine and the Pompidou Museum. All of the elegant apartments are located in various historical buildings, for this reason, some of these buildings are not equipped with an elevator. Each includes a DVD and CD player and cable TV, and some have a balcony and exposed wooden beams. You can prepare your meals in the fully equipped kitchen in the Apartments Paris Center - At Home Hotel, which includes a fridge, oven and microwave. All apartments have an private bathroom. Some are near the Marais and the Orsay Museum and they are all a short walk to a Metro Station, which can provide a direct link to Montparnasse and Gare de l’Est train stations as well as Gare du Nord Train Station with Eurostar and TGV lines. 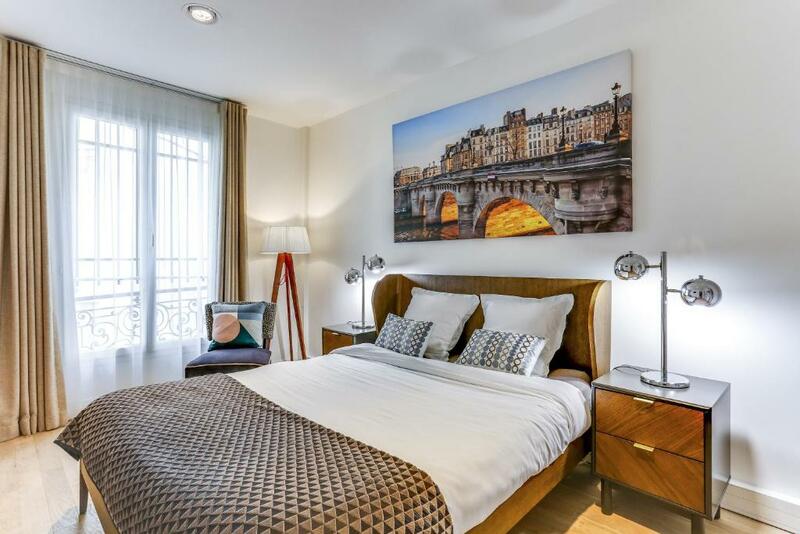 뀐 Located in the real heart of Paris, this property has an excellent location score of 8.1! When would you like to stay at Apartments Paris Centre - At Home Hotel? This studio includes a living area with a kitchenette and a sofa bed. You are required to tidy your apartment or studio and empty the bins before departure. If the accommodations does not meet the property's expectations, a minimum EUR 16 penalty will be charged. This apartment has 1 bedroom and a separate living area with a kitchenette. This apartment has 2 bedrooms and a separate living area with a kitchenette. A 12 years experience in quality apartments rentals in Paris' heart. Trust our team of experts as we will be here to welcome you, give you recommendations and offer the best services for your stay in Paris. Our guests reviews speak for themselves! I was born in Caracas, Venezuela, I love how new technology helps us stay in contact. You won’t be surprised to learn that I love social networking, My favorite hobby is traveling around the word and taking some pictures to share my experiences. Area Info – This neighborhood is a great choice for travelers interested in food, art and culture – Check location Great location - show map Guests loved walking around the neighborhood! House Rules Apartments Paris Centre - At Home Hotel takes special requests – add in the next step! All children under 6 years are charged EUR 39 per night for extra beds. Apartments Paris Centre - At Home Hotel accepts these cards and reserves the right to temporarily hold an amount prior to arrival. You can pick up your keys in the offices located at 236 Rue Saint Martin, in the 3rd district of Paris. A member of the team will gladly provide you with all the necessary information on how to get to your apartment. Apartments are located in the 1st, 2nd, 3rd, 4th and 8th districts. A security deposit of EUR 500 or EUR 700 (depending on the apartment category booked) will be payable by credit card. The deposit will be returned when you check out once the check-out inventory has been completed. Please note that the agency closes at 17:00 during the week. It is closed on Saturdays, Sundays and bank holidays. If you plan to arrive outside of the reception hours, please contact At Home Hotel directly regarding the late check-in procedure. In this case, the property will charge the total amount of the reservation via online payment service before the arrival day. Please note that if the procedure cannot be arranged, the agency cannot guarantee the reservation. If you cannot pay online or provide the documents requested by e-mail 24 hours before you arrive, your check-in will be conducted with a company representative for a supplement of EUR 89. You will need to pay for all of your stay as well and leave the security deposit of EUR 500 or EUR 700 (depending of the apartment category booked) in cash. If you choose to pay for the cleaning during check-in, you will pay a fixed rate of EUR 34 for a one bedroom apartment, plus EUR 10 for every extra bedroom. If you decide to clean the apartment yourself, you are required to tidy your apartment or studio and empty the bins before departure. If the accommodations does not meet the property's expectations, a EUR 28 per hour of cleaning penalty will be charged. Please note that At Home Hotel will contact you by email to give you the access code. You will receive bed linen for the length of your stay and a welcome pack. You must show the credit card used for the booking upon check-in. The rental will be made under the name of the person who paid for the reservation. The number of guests who check-in at the reception desk must match the number specified in the reservation and will show in the contract. Please inform Apartments Paris Centre - At Home Hotel of your expected arrival time in advance. You can use the Special Requests box when booking, or contact the property directly using the contact details in your confirmation. Please note that check-in and key collection take place at: 236 rue Saint Martin, Paris 75003. It’s a very small apartment, doesn’t look like the pictures. But the location was great and the staff was friendly. The kitchen wasnt very clean. Very comfortable appartement. Two bedrooms with two bathrooms and 2 hairdryers. Great location (rue de Saint Martin) close to the Pompidou and Châtelet Les Holles. Louvre just in 20 min walk. Supermarket G20 in 5 min walk. A lot of bars & cafes near by. The WiFi connection was unreliable. Great location, friendly staff, large apartment close to everything we needed. It was a long nightmare, it started with the payment being forced upon me,We had the right to pay on the spot and they wanted to charge 89 euros for it, which they did not have the right to ask for, on the confirmation of the invitation, they were not allowed to ask, according to what I was told at Bocking, and took us € 500 security returned 18 days laterWe ordered at the address of the apartment in Bucking what turned out to be an agency and there is no apartment there and the apartments are scattered in the area and not very close, it should be noted that it is excellent in small print, 15 min walk with luggage , Collecting the keys was cumbersome and inconvenient, with a safe and codes and operating instructions.,The apartment was on the second floor without an elevator, with narrow wooden steps, rotary, and no windows in the apartment outside, only an internal patio with tenants sitting there,,,There is no linen change, no towel replacement, no basic products, and there are 2 rolls of toilet paper. The tenant assured us that we could leave the suitcases in the agency on the last day because of late flight at night, and then at the last minute he said there was no possibility of forcing us to walk around Paris with suitcases to look for luggage and pay 24 eurosThe bathroom was close to the bed, there was no place to move, we did not have continuous hot water, the toilet water ran out constantly, we complained about it all, and we did not receive a response, a dismissive, terrible treatment. The bathroom was close to the bed, there was no place to move, we did not have continuous hot water, the toilet water ran out constantly, we complained about it all, and we did not receive a response, a dismissive, terrible treatment. The property we were given was not the one in the photographs nor was it in the location listed. They still haven’t provided a refund of the deposit, despite confirming everything was fine. The stay was great. I read a few reviews and was a bit worried but the people i spoke to gave me comfort. This was a last minute booking i made and to my surprise this was a great stay... btw, they take deposit of eur500 and make you sign a contract, but with me they returned on time and in full.. The staircases to the property are so unstable and difficult to climb especially with carrying luggages. The door lock is very difficult to open and almost made us panic as we were locked out and couldn’t get back in for awhile. We called the emergency number but only got a very unclear message and didn’t even get a response back. Lucky we managed to try the key again and finally managed to open the door. Bathroom door could not be locked and the drainage for the sink in the bathroom was very bad and took a while to drain. Water in the shower was very slow. No number on the apartment is very confusing. The location is very good, closed to shops and restaurants. The apartment is not for 4 people, and having a sofa bed does not accommodate all the adults. They mention lowering costs of the apartment but the methods they use are not appreciated - like providing one toilet roll only, guests have to clean up even though they pay cleaning fee. The apartment's managing company uses not so friendly strict and professional language everywhere. The parking is not available at all apartments, and parking is costly in Paris. The staff were very friendly, understanding and professional all the time. The location of the apartment was great. The apartment check in process is good. The floors could be more clean. There was not shampoo or bodywash in the bathroom. The location was fantastic. It was in the heart of Paris. Most of the attaractions were so closed that we preferred to go by walking. The appartment was comfort. The agancy personel were polite and were always ready to be helpful. Many items in the property were broken. A lot of twisting and narrow stairs to climb. Pictures provided were somewhat deceiving. Deposit amount was too high, considering it was almost more than the price I paid for accomodation. Pictures a little bit deceiving. I can not think of anything that I did not like.